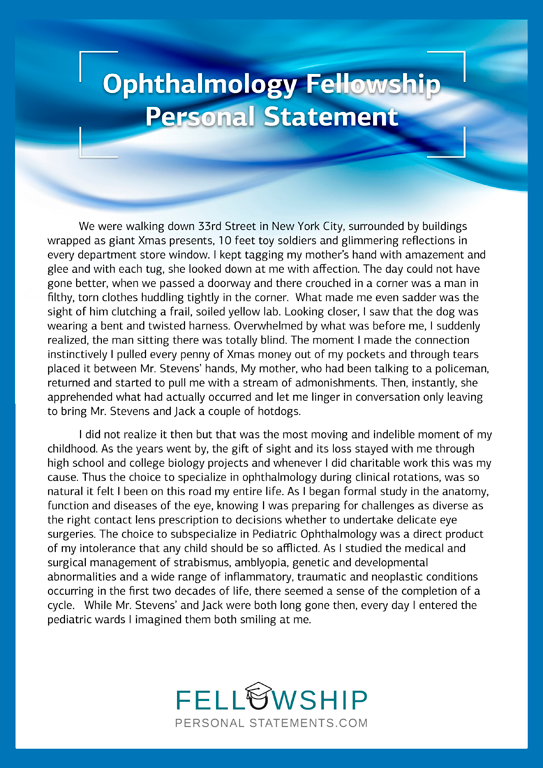 Why Use Our Professional Fellowship Personal Statements Services? You will be required to submit a wide selection of documents when applying for an international ophthalmology fellowship or the same on a national basis. As part of this paperwork, you will need to include your medical fellowship personal statement for an ophthalmology fellowship. This is one of the most important documents for helping you obtain the fellowship you target, if written well it will surely heighten your chances for a personal invitation to an interview with the admission committee. It will have to be written in a completely interesting way that will force the reader to continue reading right through until the end once they have started reading. Only when written in the right way will you have a chance to be rewarded with the targeted invitation to an interview. This can, in turn, increase your chances of being chosen for that fellowship in ophthalmology. We will dedicate the writer with a PhD in ophthalmology to create your personal statement for international ophthalmology fellowship. Being knowledgeable about the requirements will automatically increase your chances with the board. They will contact you to gain the basic information that they will need before setting out to do the work. This will be a personal statement of high quality due to him being aware of the application procedure for a fellowship in ophthalmology. Include your reason for choosing this fellowship – Where does your interest come from? “My brother Dalton was born blind and required special education that taught him how to deal with life in our vibrant society. It also gave him his passion for reading books, even though they are printed in Braille. My mother was offered a job at the center taking care of other blind children, and she has been working there ever since. This often offered me the chance to go along with them and connect to these vision impaired kids and learn their story and what caused their deficiency. After having been with them for some time, the thought formed in my mind that led me to become a doctor and to extend my studies into ophthalmology. I want to be able to help such children regain at least some vision to increase their quality of life. I have tried living in absolute darkness while being blindfolded for three days and found it absolutely challenging but lacking many facets of my actual life. After the fellowship, I want to practice ophthalmology in different clinics to further my education and gain more knowledge. After having done so for about five years, I then intend to practice for another five years while collecting all the relevant data. Avail yourself of our excellent offers for a national ophthalmology fellowship personal statement writing service or even an international ophthalmology fellowship by contacting us!